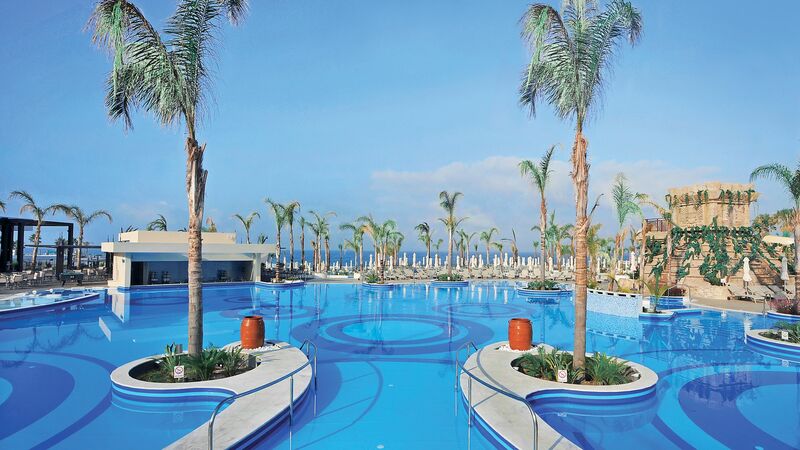 The Olympic Lagoon Resort Paphos opened in 2015 and is set on a popular Blue Flag beach.The hotel offers a luxury all inclusive concept with a choice of five restaurants, five bars, snacks and local ice cream. The children's clubs, including the crèche for babies are also included. Ideal for families, the hotel has four swimming pools including themed lagoon pools, a Mayan Temple with integrated water slides and a luxury free form indoor pool as well as excellent family entertainment. There is also an adults only section with its own pool as well as a rejuvenating health club and spa with a wide range of treatments. With its beachfront location, there's no surprise that this hotel is popular for weddings and is a lively resort with lots going on for all the family. The hotel has 276 rooms. Hotel child prices apply to ages 2-12 years. 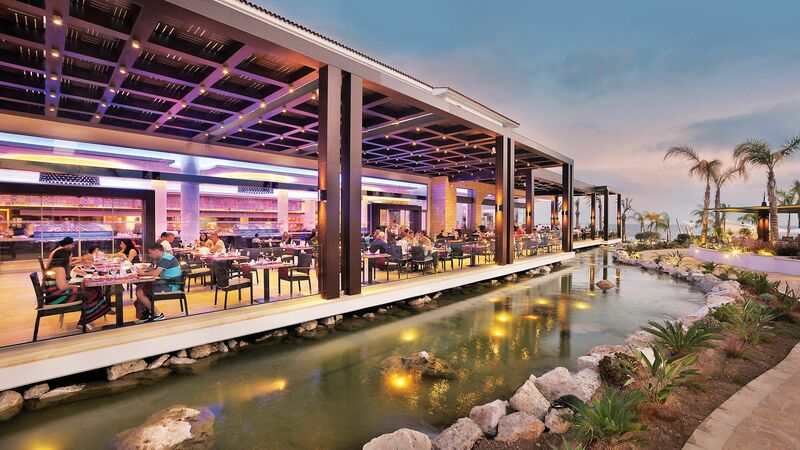 Luxury All Inclusive: Buffet breakfast and lunch. 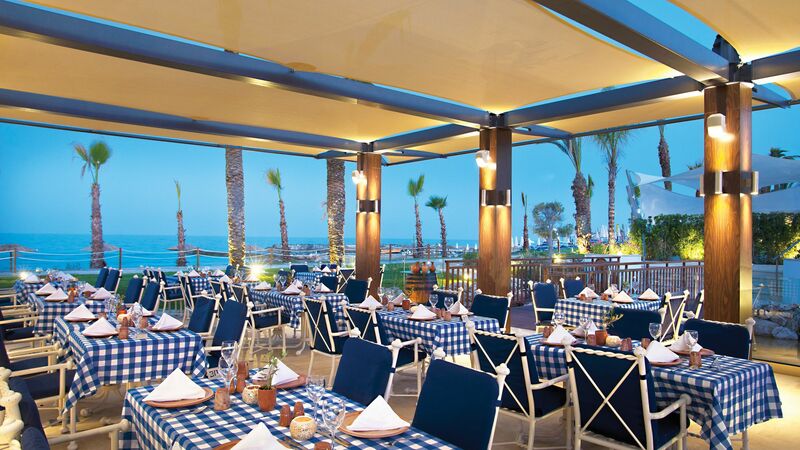 Buffet dinner plus one dinner per stay at 2 theme restaurants Seven Orchid Pan Asian and Garibaldi Italian (adult's only) and two dinners per stay at Captain's Deck Cypriot Taverna (supplements apply for subsequent visits). Rock 'n' Roll Diner can be used daily. Snacks served between 10.30 - 18.30. Ice cream served at the Blue Lagoon Bar or Blue Lagoon Kiosk from 10:00 to 23:00. Full range of premium local alcoholic and non-alcoholic beverages served between 10:00 - 23:00. 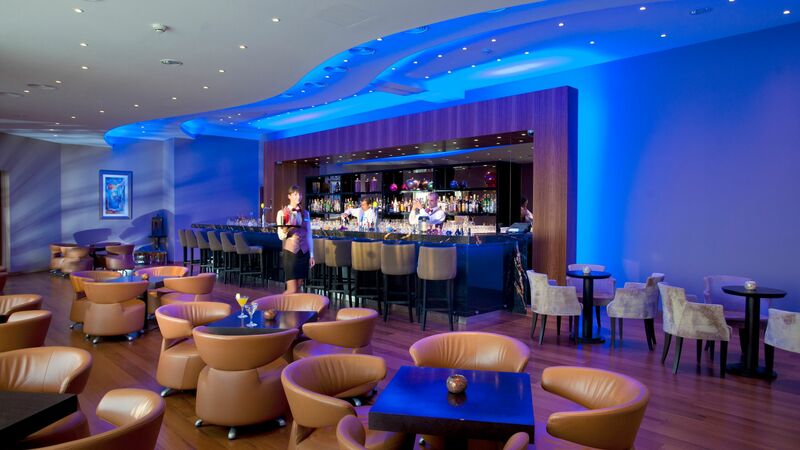 Drinks and refreshments in a choice of 2 bars, as well as in the lobby lounge. 2 bottles of mineral water, 2 soft drinks and 2 cartons of orange juice in the mini bar on arrival. Bottles of water replenished daily. A bar with swim-up seating located at one end of the pool for guests to cool off during the day by enjoying a selection of refreshments whilst marvelling over panoramic views of the ocean. Smart casual (tailored shorts accepted, no T-shirts or sleeveless shirts allowed, closed shoes recommended). Enjoy delicious Asian cuisine including specialities from Malaysia, Thailand, Japan and China. Adults only dining takes place from 20:30. 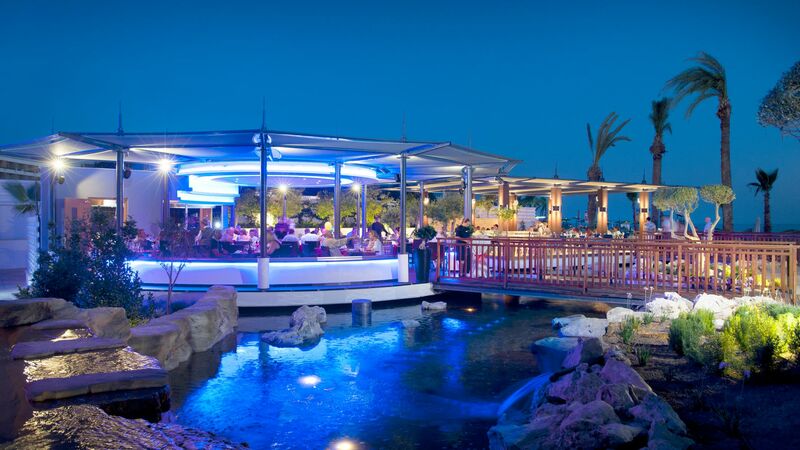 Guests can dine at this restaurant once per stay as part of their all inclusive package, after this there will be a charge of 15euro per adult and 7.50euro per child. Smart casual, long trousers, closed shoes required and no T-shirts or sleeveless shirts allowed for men. 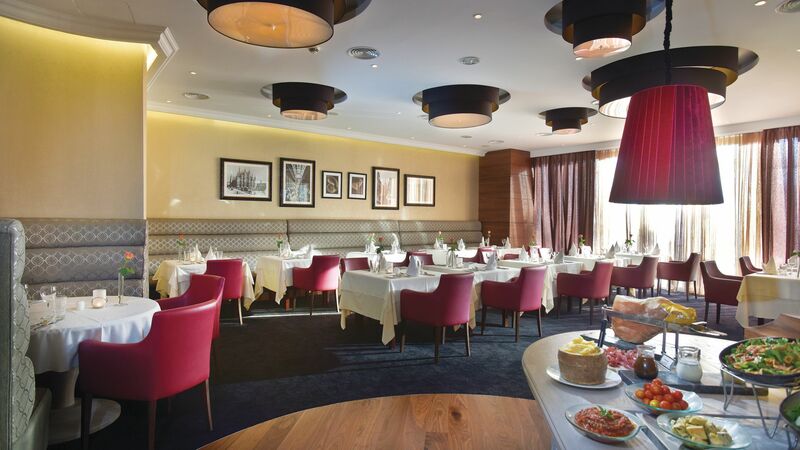 An adults only restaurant serving four courses of authentic and modern Italian cuisine in a relaxed and inviting setting. Guests can dine at this restaurant once per stay as part of their all inclusive package, after this there will be a charge of 25.00 euros per adult. 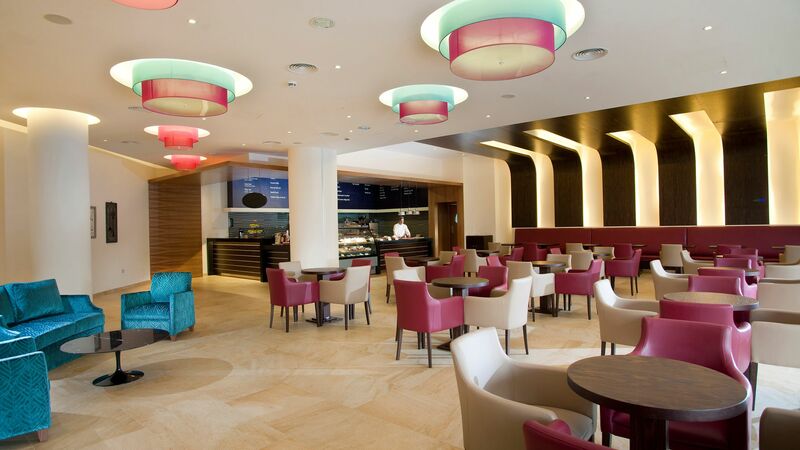 The Grand Lobby & Terrace is a spacious sun-filled area beside reception where you can enjoy cocktails, beers, soft drinks, coffees and a selection of cold snacks. Dinner. Evening Casual (tailored shorts allowed, no T-shirts or sleeveless shirts or flip flops allowed). 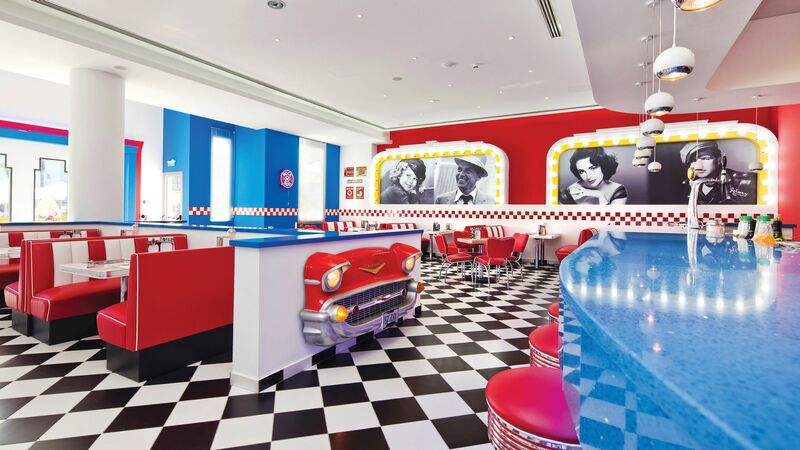 Rock 'n' Roll Diner is a themed family 50's restaurant serving burgers, sandwiches, fries, milkshakes and dessert. Breakfast and lunch: Shorts and T-shirts are allowed. Dinner: smart casual at dinner time (tailored shorts accepted, no T-shirts or sleeveless shirts or flip flops allowed, closed shoes recommended). The Royal Olympic Restaurant is open for breakfast, lunch and dinner serving international buffet and themed dinner buffets in the evenings. There is a designated adults-only area and also a buffet specifically for children. The Captain's Deck is a Greek/Cypriot taverna serving traditional dishes including meze and meal platters using local ingredients. Guests can dine at this restaurant twice per stay on the premium all inclusive package, after this there will be a charge of 15 euros per adult and 7.50 euros per child. Reserved for adults only for guests staying in Superior Rooms, Fisherman's Village Rooms and the Honeymoon Suites, the Serenity Pool Bar is a bar and swim up bar in the free-form Serenity Oasis lagoon pool. It serves cocktails, beers, soft drinks, a selection of coffees and cold snacks. You & Me Bar is the perfect place for a spot of relaxation. All ages are welcome and from 21:00 the venue is reserved for adults to enjoy a range of beverages including classic cocktails whilst enjoying light evening entertainment. The Olympic Lagoon Resort is ideally situated close to the beachfront, meaning that it's just a short walk to the golden sands and lapping waves. The water is shallow and great for a gentle paddle, plus the hotel is only moments away should you crave the waveless water of the pools. 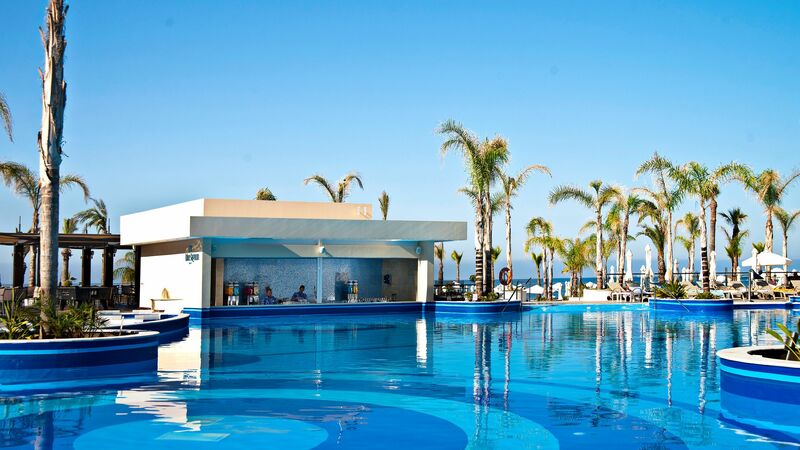 Set on a beautiful sandy blue flag beach, the Olympic Lagoon not only has the benefit of the refreshing sea on its doorstep, it has 4 lagoon pools, an indoor pool, waterfalls, whirlpools, back massage jets and a themed Mayan Temple with integrated water slides. Guests staying in the adult only wing of the hotel are treated to the Serenity lagoon pool and there is also a child friendly pool with water features. 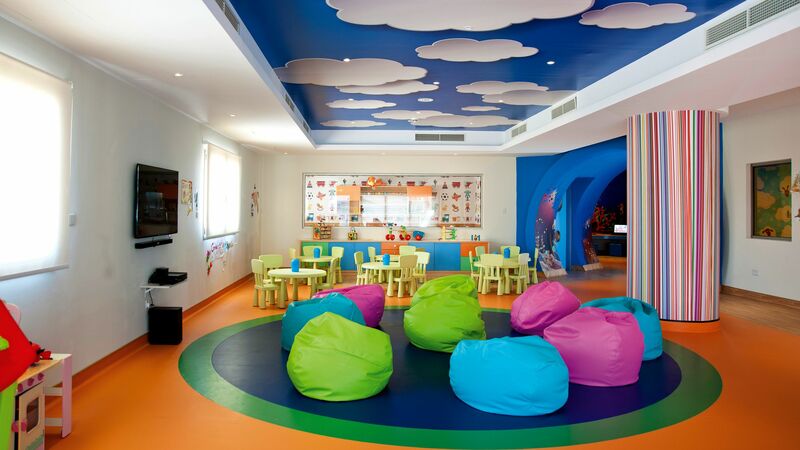 The Little Monsters Kids Club caters for children from 6 months - 12 years. For children aged 3 - 12 years, the club offers a wide variety of supervised play including arts & crafts, party games, sports and outdoor activities. A designated nursery offering stimulating activities within a caring environment is also available for children between 6 months - 3 years. The crèche must be pre-booked 24 hours in advance and can be arranged via the Kids Club. For older children, the Teenz Club is a great place to come and hang out but still with adults supervision. 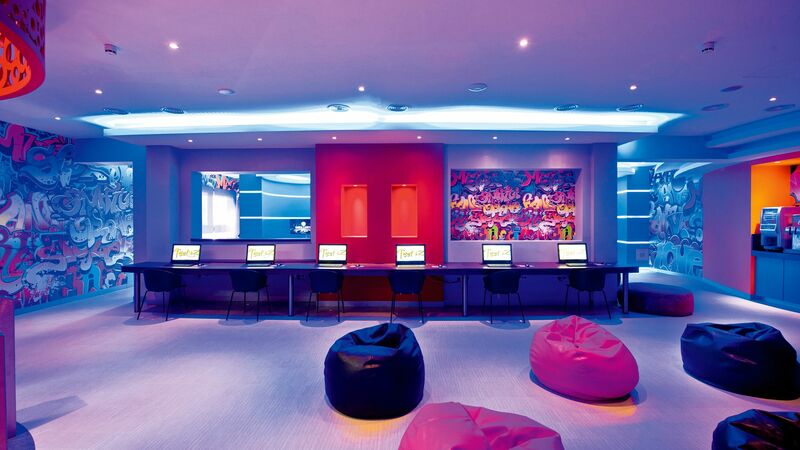 It has state-of-the-art video game booths, an internet café and a chill-out club with soda bar. Activities and entertainment are also organised. Payable locally. 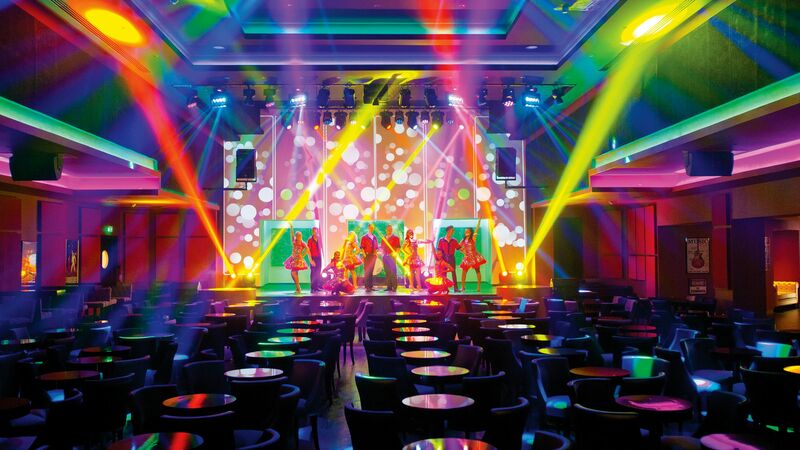 With state of the art sound and vision, the X-perience Arena hosts a number of events from live bands to Broadway style shows. It serves cocktails, beers, wine, champagne and sparkling wine, cognacs and brandies, liqueurs, soft drinks and coffees. Pretty Paphos is a unique Cypriot town, balancing a picture-perfect coastal setting with an incredible collection of historic remains. 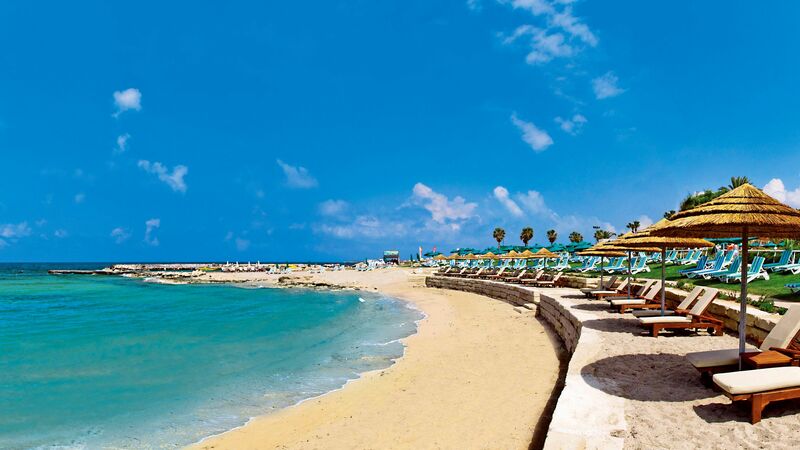 Set beside the water, Paphos is classically Mediterranean. There are sand-and-shingle beaches and a lovely harbour filled with bars and restaurants; a real nightlife hotspot after dark. A smart, café-lined promenade sweeps along behind. If you're interested in wildlife, head to nearby Lara Bay - endangered turtles nest on the beach here. Further inland, you’ve got ancient Paphos. The archaeological park encompasses the 4th-century old town, with its intricate mosaics and frescoes, plus the 1,000-year-old Tombs of the Kings, a UNESCO World Heritage Site. Pack some comfy shoes – there’s a lot to see here. Deluxe Rooms are located in the main building and are elegantly designed with comfortable furnishings. The rooms have either two twin beds or a double bed and a balcony with furniture offering inland views. The mini-fridge is stocked with welcome drinks on arrival and tea and coffee are replenished daily. Please note the image is of a Deluxe Room Sea View. These Deluxe Rooms offer a glimpse of the sea from the balcony, as well as all the great standard amenities including either two twin beds or a double bed, a balcony with furniture, and mini-fridge stocked with welcome drinks on arrival. Please note the image is of a Deluxe Room with sea view. Enjoy views of the sea and pool from this popular room option. Situated in the main building, these rooms come equipped with a furnished balcony, twin or double beds and a mini-fridge stocked with welcome drinks on arrival. Family Junior Suites are beautifully decorated, and incorporate gentle tones with stylish furnishings. These rooms come equipped with a double bed and two single beds that are separated by a sliding partition for privacy., and a second television in the children's room area makes it easy to keep the young ones entertained. The balcony is provided with furniture and offers inland views. Please note the image is of a Family Junior Suite with sea view. Family Junior Suites are tastefully decorated in soft neutral tones and offer a double bed and two single beds that are separated by a sliding partition for privacy. A second television is provided in the children's bedroom area with a selection of games provided through a TV entertainment system. The balcony is provided with furniture and offers views of the pool and sea. Deluxe Superior Rooms are located in the exclusive adults only wing of the hotel and have a two poster double bed and a spacious and luxurious bathroom with a full-size window, bathtub and rain-shower. The balcony is equipped with furniture and offers side views of the sea. The rooms have a mini-fridge that is stocked with welcome drinks on arrival and tea and coffee that is replenished daily. Guests must be 18+ in the adults only wing. Please note the image is of a Deluxe Superior Room with a sea view. 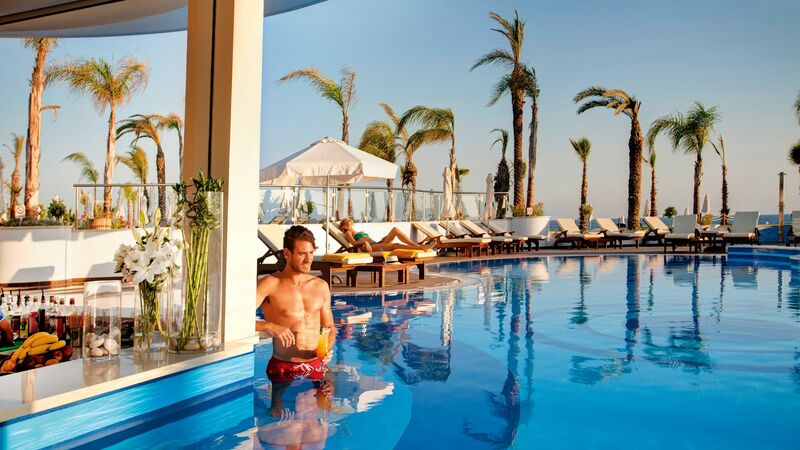 Enjoy mesmerising pool/ sea views from the comfort of your furnished balcony with this adults only room option. A two poster double bed adds a touch of romance to your stay, whilst the spacious bathroom with a full-size window, bathtub and rain-shower makes it easy to relax. The rooms also come equipped with a mini-fridge that is stocked with welcome drinks on arrival and tea and coffee that is replenished daily. Guests must be 18+ to stay in the adults only wing. These rooms are located on the ground floor of the exclusive adults only wing and offer traditional elegant Cypriot décor and a four-poster luxurious bed. The bathroom has a full-size window giving plenty of natural daylight and a large bath and walk-in shower. The room also has a private terrace with a path that leads to the private adults only Serenity lagoon style pool. Guests staying in this room will receive luxury loungers and waiter service around the Serenity lagoon pool. Guests must be 18+ to stay in the adults only wing. These rooms are located on the first floor of the exclusive adults only wing and offer traditional elegant Cypriot décor and a four-poster luxurious bed. The bathroom has a full-size window giving plenty of natural daylight and a large bath and walk in shower. The room has a spacious private balcony with lounge chairs that has views of the pool and sea. Guests staying in this room will receive luxury loungers and waiter service around the Serenity lagoon pool. Guests must be 18+ to stay in the adults only wing. These rooms are located in the exclusive adults only wing and offer traditional elegant Cypriot décor and a four-poster luxurious bed as well as private plunge pool. The bathroom has a full-size window giving plenty of natural daylight and a large bath and walk-in shower. Guests staying in this room will receive luxury loungers and waiter service around the Serenity lagoon pool. Guests must be 18+ to stay in the adults only wing. Honeymoon Suites are situated in the adults only wing opposite the Serenity pool and have full views of the sea. Decorated and furnished to a create an atmosphere of romance and intimacy, these suites have a four poster bed and luxurious bathroom offering a large bathtub and walk-in shower. The suite also has a double sofa for comfort and the balcony is furnished. Guests must be 18+ to stay in the adults only wing. Sovereign guests receive complimentary breakfast in bed once per stay on the morning after arrival (to be requested on arrival) for holidays between 01 November 2018 - 31 October 2019. Stayed at the lagoon in Feb 2019. Treated with warmth and great service from the day we arrived to the day we left. We had a late flight back (midnight) and the hotel let us use all the Hotel facilities past our check out time. Would definitely visit again . We loved our stay here. The facilities are excellent, everything is immaculate and well maintained. Our daughter loved the kids club and the evening entertainment/shows were outstanding. All staff that we interacted with were very friendly and helpful. Stayed at this hotel 24 March for one week all inclusive and was not disappointed. 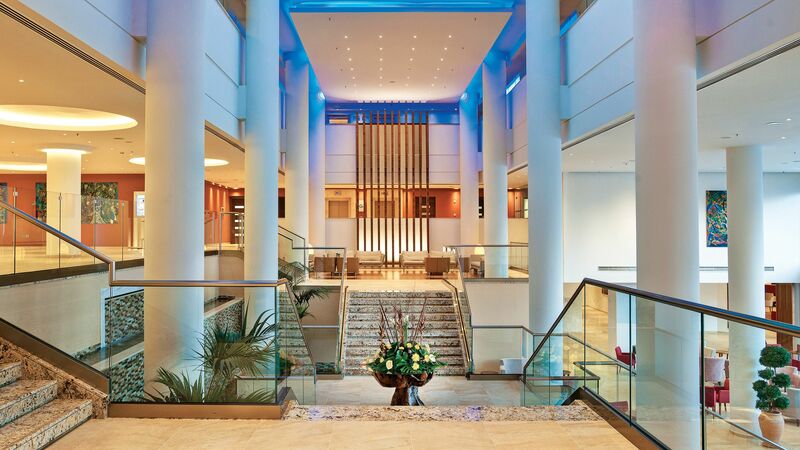 Greeted on the doorstep and cases taken into the lobby, check in was very fast and efficient, cold drink on arrival. We were advised that the hotel was exceptionally busy that weekend as it was a Cypriot bank holiday but should be calmer by Tuesday! Extremely helpful porter took the cases to our room and made sure we knew where everything was and how to operate the safe, air con etc. Was relieved to find that the air con did provide heat as it was quite cool at night. No extra charge for using the safe. Room was lovely, comfortable bed and extra pillows provided. Good choice of toiletries which were topped up throughout the stay. Minibar on arrival contained bottle of water, which was replenished daily, and also a Sprite and Coke which was not replaced. Tea/coffee topped up daily too. Room was kept spotlessly clean throughout the week, as was everywhere else in the hotel. Only one complaint about the room, on one occasion the maid did not leave any bath towels and it took about 45 minutes and a couple of calls to get these, luckily we weren't in a rush to get showered! Food was fantastic, so much to choose from and excellent quality, different theme each evening in the buffet restaurant. All house wine palatable but you can purchase other wine if you want to. Being seated at a table instead of having to search for one is a bonus, especially on our first night when the restaurant seemed full to capacity (due to the bank holiday influx); unfortunately we had to queue for approx. 15 minutes for our main course and breakfast the following morning. Happily these were the only times this happened as many guests left on the Monday. Plates were always hot and the food replenished regularly. Cava was only provided at breakfast on Sunday and there didn?? ?t seem to be smoked salmon available at all (unless I missed it!). Restaurant staff all friendly. Only one niggle, sometimes dirty dishes not taken away promptly, even when restaurant wasn?? ?t that busy, staff seemed more intent on setting up tables for the next session. As part of AI you could dine once per stay in the Italian restaurant; would definitely recommend this, book as soon as you arrive. Food and service was excellent. Meal consisted of five courses; anti pasti buffet (so much to choose from), soup, main course, dessert, ending with coffee/tea and petit fours. We chose lamb shank and sea bass as main courses, then of course tiramisu for dessert. Good varied menu, all dishes being brought out looked delicious. Men are required to wear long trousers and collared shirts. We also ate in the American Diner on a couple of occasions, once again food and service was excellent. Varied menu, we tried the steak and one of the many burgers on offer, very tasty! From April to October you can eat in here at lunchtime too. Sadly the Asian Restaurant wasn?? ?t open until April, so we missed out on that one too. Bar service was very efficient, as soon as you sat down someone was there to take your order and staff were friendly. The usual branded spirits were available in AI, along with a good range of cocktails. It was quite nice to sit in the pool bar overlooking the sea and promenade (weather permitting) but the chairs became a bit uncomfortable after a short while, perhaps having a cushion on them would help, especially as not many guests were using the pools due to them being so cold. Didn?? ?t use the heated indoor pool or the gym but they appeared to be very well maintained. Evening entertainment was excellent, particularly the illusionist, can?? ?t imagine how he performed some of his tricks! Alternative entertainment also in the piano bar. Didn?? ?t take part in any daily activities but there were a few things going on throughout the day. Unfortunately the weather was not brilliant. First half of the week was warm and sunny and we never had a problem getting a sunbed. However, the second half of the week it rained more or less constantly and was quite cool. If you?? ?re holidaying at this time of the year take a mix of clothes and don?? ?t forget your brolly! You can go for a stroll along the promenade towards the harbour, this takes about half an hour or another alternative would be along the road, where you?? ?ll find various shops and bars along the way, as well as the ones in the harbour area. Our Jet2 Rep also told us about a few places nearby and said that the buses were quite a good option for getting around, although we didn?? ?t use them. We took advantage of the free Resort Flight check in offered by Jet2; we?? ?ve used this before at other resorts and have to say it?? ?s a great service. They pick up your cases in the morning and take them to the airport and all you need to do is go straight through to security, no queuing to check in. We had a lovely relaxing week, despite the weather, and will more than likely return to this hotel at some point in the future. A big thank you to all the staff, you are all very hard working and always smiling. We?? ?ve just returned from this fabulous resort. The food was really top quality, the service was terrific!! The kids club was perfect for the 6 and 9 year old girls. They loved all the activities , and a movie every night was just perfect to finish each day. The outside was just gorgeous with crystal clear pools and water slides, perfect for everyone!! The whole resort is impeccable!! It completely deserves 5 stars!! On the whole this was a very good hotel, some things were exceptional, others just good. The hotel and grounds were very good and were exceptionally clean. Really good high quality furnishings inside and outside with very good sun beds.we found the staff were friendly well trained and offered excellent service. Both adult only and families well catered for, I liked the adult only bar when I needed a chill out. The room was probably the best room I have stayed in, in a holiday hotel. Very clean and well maintained every day, not just a quick making of a bed it was cleaned thoroughly every day. Lively bathroom and room had excellenttea and coffee facilities. The food, which is always subjective to personal taste was mostly very good. Really good salads and fantastic proper desserts, not the usual mass produced rubbish. The cheese and fruit selection were also very good choice and quality. However the main courses and just the main courses were underwhelming and to offer one fish dish at the evening meal is really poor for a hotel of this standard. I expect a 4 or 5 star hotel to offer more seafood and fish, this clearly let's the hotel down. I have had better choice of main meals in plenty of other hotels, this is not to say the food was bad just I and other guests I spoke to expected better. The breakfast was good and offered a very good choice of fruits and cheese. The Italian restaurant was outstanding both for service and food. Thesnackbar has a Good choice of sandwiches all but one had dressings on as did the salads, not great if you have an allergy ordislkke dressings. We did order sandwiches one day but we're told to come back to collect them after an hour. Maybe just a few of the delicious sandwiches could be made up just plain. Reception staff very helpful. All in all a good hotel but a few tweaks needed to make it great.